The United States Congress designated the Kalmiopsis Wilderness (map) in 1964 and it now has a total of 180,102 acres. All of this wilderness is located in Oregon and is managed by the Forest Service. This nearly 180,000 acre Wilderness includes the headwater basin of the Chetco and North Fork Smith Rivers and a portion of the Illinois River canyon. This is a harsh, rugged area with a unique character. Elevations range from 500 to 5,098 feet (Pearsoll Peak). The area is characterized by deep, rough canyons, sharp rock ridges and clear rushing mountain streams and rivers. Diversity of topography and geology provide excellent habitat for a wide variety of botanical species. The Kalmiopsis Wilderness is well known for it's diversity of plant life. Much of this diversity results from plant species adapting to life in harsh soils derived from peridotite and serpentinite rocks. Both are rich in heavy metals such as magnesium, iron, chromium and nickel, which in high amounts, can be toxic to most plants. The diversity of plant habitat has been the result of a combination of geologic forces (uplift, folding and faulting), erosional and depositional forces (glaciation, weather, climate and the action of rivers), and periodic fires. The Kalmiopsis leachiana plant was discovered in 1930 by Lilla Leech in the Gold Basin area. The plant is a relic of the pre-ice age and the oldest member of the Health (Ericaceae) Family. The Kalmiopsis Wilderness was named after this unique endemic shrub. Besides being a place of great botanical interest, the Kalmiopsis Wilderness is also one of the most unusual and complex geological areas of our country. 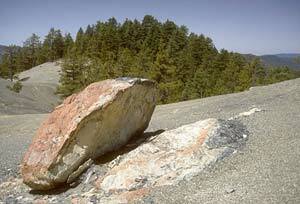 The Kalmiopsis is part of the Klamath Mountain geologic province of northwestern California and southwestern Oregon. The eastern half is part of the Josephine "ultramafic" sheet. Ultramafic denotes being very high in iron and magnesium. The western half is underlain by the contorted sedimentary rocks of the Dothan formation and by the igneous intrusive rocks of the Big Craggies. Most of the rocks in this province were formerly parts of the oceanic crust and included serpentine, submarine volcanic flow rocks, intrusive granite-like rocks, and sedimentary rocks such as shale and sandstone. The Wild segments of the Illinois, Chetco and North Fork Smith Rivers flow through the Kalmiopsis Wilderness, providing clear water, fish habitat and water-based recreation in a remote and primitive setting. Lake environments are limited, primarily to Babyfoot Lake on the eastern boundary and Vulcan Lake on the west. Since these areas are readily accessible from nearby trailheads, they do receive a greater amount of day-use visitation. The nearly 500,000 acre Biscuit Fire of 2002 included the entire wilderness area. The environment has changed dramatically and provides a unique opportunity to observe a natural response to fire disturbance through plant succession, erosional and depositional occurrences and changed habitat for flora and fauna. While the lightning caused fire was a natural event for the wilderness it did provide damage to the nearly 160 miles of trails and trailhead facilities. Large areas of high fire severity occurred, killing much of the overstory trees in these areas, which will result in continued damaged to the trail system over time. The trails have always been challenging due to their steepness and narrow rocky surface. The impact from the fire includes added challenges, such as large numbers of downed trees, missing trail signs, holes and lose rock on the tread etc. For now and in the foreseeable future, wilderness users should recognize the need for increased safety awareness when traveling and camping. Planning to Visit the Kalmiopsis Wilderness? How to follow the seven standard Leave No Trace principles differs in different parts of the country (desert vs. Rocky Mountains). Click on any of the principles listed below to learn more about how they apply in the Kalmiopsis Wilderness.